To reach this screen, you must first open the TAD application on the phone. Please see the instructions provided here. 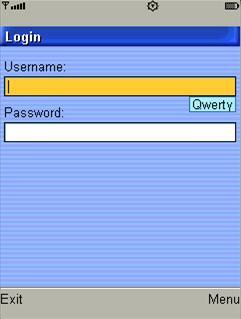 Then type in your user name and password and select “Log in” from the menu. Use the arrow keys to select a trip you created on the website. Once you’ve highlighted your desired trip, press the OK button. Selecting the “Preferences” menu item will take you to the preferences screen seen in step 5 below. Your stop is next! Select the “Confirm” menu button and pull the bus’s cord to exit the bus at the next stop. This screen can be reached by selecting the “Preferences” menu button seen in step 2. Use the arrow keys to move between the preferences and the OK button to enable or disable a preference. 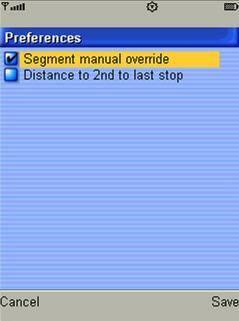 The “Segment manual override” option enables the “Skip segment” menu item show in step 3 in case you want to manually skip a segment of your trip. This feature is particularly useful if TAD fails to give an alert for the first segment of your trip, but you’d like to continue on to the next segment. The “Distance to 2nd to last stop” option displays the distance to the 2nd to last stop while you’re taking a trip (see step 3 to see it displayed) and is used to help us debug TAD. The algorithm TAD uses to decide when to give the alerts to the rider is based on the distance the rider is from the 2nd to last bus stop in the current trip. The casual user of TAD will likely not need this information. 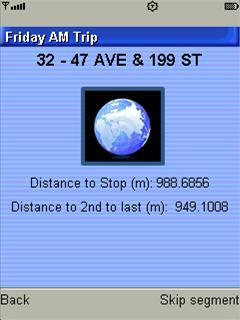 If TAD fails to give an alert on a particular trip, a valuable piece of information a tester can provide is the “Distance to 2nd to last stop” field value, when the bus is actually passing the 2nd to last stop, since this is a pretty good indicator as to whether that bus stop is in the right location in the bus stop inventory. While watching the video, please follow along using the steps below to update TAD. Please note there is no sound for this video. When an update to TAD is available, we will send a text message to your phone with a link to the installer. Scroll down, select the link, and press “Go”. The browser will open and TAD will begin downloading. You may receive a warning if TAD is already installed. Press “OK” and select “Overwrite”. After the download finishes and the screen says “*NEW DOWNLOAD*”, select “Run”. Select “Always Allow” when TAD requests access to Sprint Extensions. Select “Always Allow” when TAD requests access to your GPS location. Select “Always Allow” when TAD requests access to the data network. The updated version of TAD should now be running.